Q. How long should the ramp be? A. For plant ramps Health & Safety we recommend that no gradient greater than 30% (16.5 degrees) should be used. Furthermore, no TUV Certified Ramp is designed to exceed this gradient. 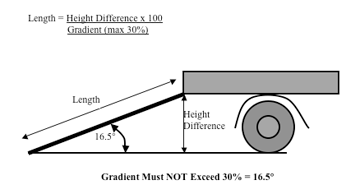 To calculate your gradient simply measure the height from ground level to the loading deck & multiply this by 3.3 to give the optimum length of ramp. Q. Do the ramps have a minimum load height? A. No but we don’t advise to use the ramps lower than 100mm of the stated max load height as they will not sit flat on the ground. For example, if the ramp has a max load height of 900mm do not use lower than 800mm. Q. Can the ramps be used over the max load height? A. No, the ramp will be too steep. Using the ramp above it’s recommended load height may cause accident, injury or death and will invalidate the warranty. Q. Should I allow extra capacity in the ramps for safety? A. No. Our ramps are manufacturer and engineered to European TUV standards, which require us to build in a 200% safety. When calculating which capacity you require you must factor in the weight of the machine, the load if any, the operator, fuel/oil and attachments. Please note if you exceed the stated capacity the warranty is invalidated. Q. How durable are aluminium ramps compared to steel? A. If the ramps are used sensibly, there is no reason why aluminium ramps should not last as long as steel, and much longer than steel ramps with wooden inserts. Q. Can I load steel tracked equipment? A. The Ramp People have a number of vehicle ramps and plant ramps that are available with a rubber coated surface or milled surface that allows the harder steel tracks to be used on aluminium ramps. The usual vehicle and plant ramps are NOT suitable for solid wheeled machinery. Q. What is the minimum track width? A. The narrowest the tyre/track of the vehicle can be on the surface of the ramp. This is to make sure the weight is spread across the surface to improve the life expectancy of the ramp. Q. When in use, how do I secure the ramps to my vehicle? Q. Do the ramps have Safety edges? A. All products are built flat top/no edges unless specified that edges are required. Products built with edges are production orders and therefore a longer lead time. The edges also decrease the usable width. Q. What if I need a specific length or width? Q. Can The Ramp People manufacture special applications/do custom builds? A. The Ramp People manufacture a wide range of aluminium and steel extrusions and have been able to solve many unusual loading problems. Previous projects include purpose made plant ramps for drilling rigs, custom built truck ramps, ramps for unloading barges, vehicle ramps for the MOD and the oil industry along with many specialist plant ramps and car ramps. We can also manufacture bespoke ramps for wheelchairs and disabled access. Modifications undertaken by anyone other than The Ramp People invalidate the warranty. Q. Can I load a forklift on a plant ramp? A. Not without first double checking with an advisor before purchasing. Forklifts are not designed to operate on inclines which means they need a very long ramp. They also have solid wheels which can damage the ramp surface so often we have to supply a reinforced model from our factory. Q. Can I use a winch to assist loading equipment? A. Winches fundamentally alter the normal weight distribution when loading machines and equipment. Stated weight limits are dramatically reduced when using a winch. Winches can be used but great care and attention must be taken, please speak with our sales advisers for help specifying ramps. The most important thing is to keep the rope of winch parallel with the ramp. If you intend to use a winch please make this clear to your sales adviser before purchasing. Product Dimensions – please note that due to manufacturing techniques and processes all dimensions of products may vary by up to 2% plus or minus of the dimensions shown on the website. The only exception to this is ramp length of our vehicle ramps and loading ramp range – the lengths shown may vary by up to 5% depending upon the connection chosen. If you require a specific length please do let us know and we can advise accordingly.